Russell & Kitty here. St. Patrick’s Day will be here next week; that is one of our favorite days of the year. St. Patrick’s Day is always associated with the Irish color of GREEN! Friends that have traveled to Ireland have told us how everything in Ireland is green, so very clean and pretty. We love green whether it is green grass or green glass or money! Of course the money is for purchasing stretch and or carnival glass. In this article we are not talking about the iridescent colors that were sprayed on the glass, but the color of the glass itself. In carnival, we mainly have ice green, lime green, russet, green and emerald green colors of the base glass along with some opalescent glass such as lime green opal, ice green opal and green opal. Stretch glass has a variety of green glass colors; again we are not talking about the iridescence nor a painted on color such as Lancaster and US Glass liked to do. 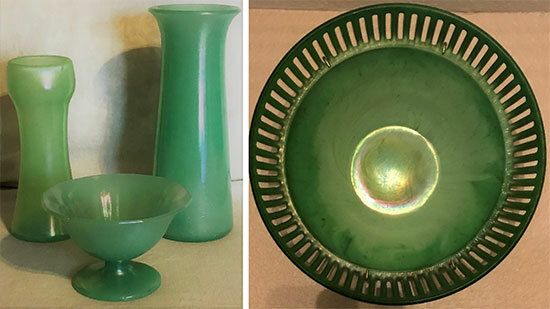 Carnival Glass collectors like to call the medium green stretch colors that were made by most of the glass companies (such as Diamond, Fenton’s Florentine, Imperial’s Green Ice, Jeannette, U.S. Glass and Vineland Flint Glass Works) ice green. Northwood had a couple of different colors of green including dark (emerald) green and russet in stretch glass. Emerald green in carnival glass is basically a green glass with blue iridescence. Remember that we are talking about the base color of glass not the iridescence in this article. Most green glass in carnival glass has the base color of glass in a dark green that we stretch glass collectors call emerald green glass. Sorry that is confusing! But as emerald green in carnival glass is rare and desirable; dark (emerald) green glass in stretch glass is also rare and desirable. The base glass color of the Tree Trunk Vase is the same as the compote. The vase has a marigold iridescence which makes the color look different. That is why we like iridescent glass! Northwood also made Russet colored glass in both in carnival and stretch glass. As the tale goes, Harry Northwood loved russet apples so why not name the glass color russet? We found this russet tumbler years ago, so we have been looking for a russet pitcher ever since. 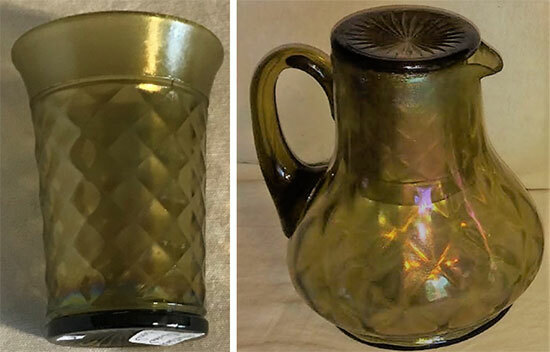 At the Stretch Glass Society’s green glass display, a russet pitcher was brought in for the display. He wanted our tumbler and we wanted the pitcher! At least now we know that one exists. The United States Glass Company made a regular line of the green stretch glass which carnival glass collectors call ice green. But they also had a line of opaque green glass which they called Jade Green. They produced quite a number of patterns in the Jade Green, but also had a variety of different vases which they only made in the opaque colors. 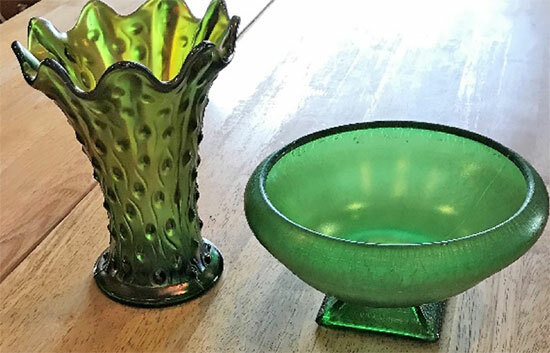 US Glass Company also produced a few pieces in a Nile Green that is a much denser opaque piece that looks like the batch of glass that needs to be stirred to make a consistent color. Sometimes communications between a carnival glass collector and a stretch glass collector can make life confusing such as talking about colors. We at SGS are working on a new project trying to make communications between the carnival glass and the stretch glass collectors better. Until we finish the special project, we will continue with our articles to help bridge the communication gap. With the color “green”, ice green to carnival collectors is the same as regular green to stretch collectors. The reverse is true with regular green carnival and dark (emerald) green stretch glass. No problems with the russet color; it is the same color to both carnival and stretch glass collectors. 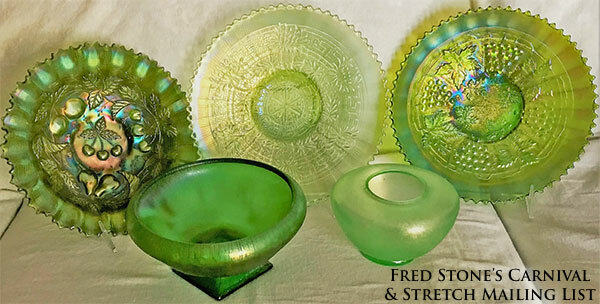 Jade green and Nile green are stretch glass colors although there is a Fenton carnival glass “Nile Green” Panther bowl. So far there is only one known (that is what the books say) and it is more of a lime green slag at least it looks that way in the book. Haven’t seen it in person. Maybe one of you owns the bowl and could send a good picture of the bowl to HOC? Does anyone have a different green base glass piece that you would like to share with everyone? We love hearing from all of you as that is the easy way to learn about our beautiful glass. While we are talking about communications, what types of articles and topics would you like for us to explore? Any special requests? Any areas that you have questions about in stretch glass?